Info Representative Janet T. Mills, (D-Farmington) was born and raised in Farmington and has been committed to a life of public service. She graduated from Farmington High School and received her J.D. from the University of Maine Law School. 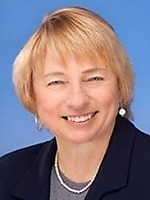 In 1980 she was elected district attorney for Androscoggin, Franklin and Oxford Counties and was the first woman district attorney in the northeastern United States. She served nearly 15 years as district attorney and was president of the Maine Prosecutors Association for four of those years. Serving in her second term as a state representative, her major areas of policy interests include education funding, health care, tax reform and judicial matters. Rep. Mills has practiced law since 1995 in Skowhegan, Maine, in the firm of Wright & Mills, P.A., with her brother S. Peter Mills, a State Senator from Cornville. She has published poetry and enjoys fishing, reading and cooking. 06/10/2020 ME US Senate - D Primary ?? ?